Before jumping into the steps of creating a Fullscreen Scrolling webpage with pagePiling.js, why don’t we have a look at what pagePiling.js really is? 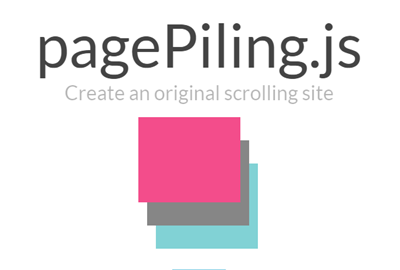 pagePiling.js Pile your web page sections one over another to access them scrolling or by URL! by doing so it provides amazing user experience. (1) Nice Background Images : In this tutorial i will be using the images that comes with the example demo of pagePiling.js package. (2) pagepiling.js : You will get the pagepiling.js in the example package. (4) pagepiling.css : You will get the pagepiling.css in the example package. Our css in this tutorial will consist of styling for the webpage body having sections with custom elements added. CSS classes are self explanatory. There are some requirements for the HTML structure like , each section needs to defined with a div containing the section class. To make any section active, just add the active class otherwise the first section will be considered as default and treated as Home page . Inside each sections you can add anything as per the requirements like menus, images, sidebars etc,. pagePiling.js is fully compatible with all modern browsers, as well as some old browsers also such as Internet Explorer 8, 9, Opera 12, etc. It works with browsers with CSS3 support and with the ones which don't have it, making it ideal for old browsers compatibility. Moreover it's also designed to work on touch devices such as mobile phones or tablets. pagePiling.js is offered under the MIT license which means you can use it free of charge for any commercial and private projects. - Compatible with all modern browsers, as well as old ones(IE 8, 9, Opera 12, etc). - Suitable for the touch devices such as mobile phones or tablets. - Easy to use and Implement.